Food safety has become one of the most challenging social issues in China that needs to be addressed. Domestic issues concerning food safety occur more frequently in China than in other countries; there are loopholes in all the aspects of the food chain—from the farm to the table; public concerns over food safety are growing. A severe scandal related to food safety was recently exposed with regards to the production and extensive use of banned cooking oil which shows that China faces a grave situation in ensuring food safety. In contrast with the different major food safety issues in developed countries, China is dealing with recurrent instances of foodborne diseases, not due to micro-organisms or environmental pollutants, but due to the illegal use of pesticides and veterinary drugs as well as adulterated materials. In October 2011, the China National Center for Food Safety Risk Assessment was established; it is responsible for risk surveillance, risk assessment, early warning and risk communication, as well as scientific support for national food safety standards. This is the first professional body that aims to offer national-level risk assessment to policy makers and the public, and is one of the few interdepartmental centres in the world, indicating an important step by the Chinese government to strengthen food safety capability building. In June 2012, the State Council issued the 12th Five Year Plan for the National Food Safety Regulation System, highlighting the Chinese government's efforts towards food safety. The plan pointed out that the government needed to comprehensively promote the development of the system in 10 areas: regulations and standards, monitoring and assessment, inspection, process control, supervision of the import and export, food safety, emergency management, comprehensive coordination, science and technology support for research and development, food safety information integrity and missionary training. Key projects will be built that aim to address the urgent outstanding issues with the weak link of the food safety regulatory system need, including food safety risk assessment, the traceability system and the national food safety information exchange platform. In future, China will still need to strengthen development and application of new technologies such as the exposome characterisation of hazards occurring in Chinese food, and particularly risk-benefit techniques for exposure assessment and translational toxicology, to provide technological support for the food safety basic research programme. As in other countries, although the main problem lies in enforcing food-safety regulations, the largest food safety issues in China are still foodborne diseases, most of which are characterised by acute gastrointestinal illness (AGI). There is a lack of practical means to ensure the implementation of foodborne disease surveillance system improvement. Since only a few cases with AGI seek medical care or submit a specimen for laboratory testing which is then not routinely cultured for pathogens, the true burden of foodborne diseases in China is not clear. During 2010 and 2011, the Center for Food Safety Risk Assessment launched the foodborne diseases active surveillance pilot work in some provinces in China, and the results highlight the substantial burden of AGI cases. It is estimated that there were 202 million cases of foodborne disease in China in 1 year, which means that about 1 in 6.6 people experienced at least one episode of foodborne disease annually (unpublished data). China also needs to establish a foodborne disease active surveillance and traceability system from patients about food-originated pathogens by laboratory-based PULSENET (ChinaFoodNet). One objective is to enhance the ability to deal with emergencies like the outbreak of Escherichia coli O104:H4 in Germany. The rapid expansion of swine production and its potential role as a source of plasmid-mediated quinolone resistance (PMQR) genes in the environment highlights the importance of international co-operation to promote the prudent use of antibiotics in medical therapy, agriculture and animal hus­bandry, and supports the need for effective treatment of husbandry wastewater before its release into the environment. Our results imply that the corre­lation of PMQR genes between wastewater and paired farm soil is a valuable first step in the environmental risk assessment of PMQR genes, but further research is needed to better understand transfer mechanisms. We also recommend the establishment of programmes to monitor antibiotic resistance genes in the envi­ronment on a global scale in order to clarify the extent of potential risks to public health. The common challenges faced by the world, such as environmental degradation and global foodborne disease outbreaks, together with the food safety issues manifested at the particular social stage of development, constitute the theme of food safety in China. Besides those listed above, there are many reasons for concern about food safety in China and for informing the public that the government is actively addressing these issues. 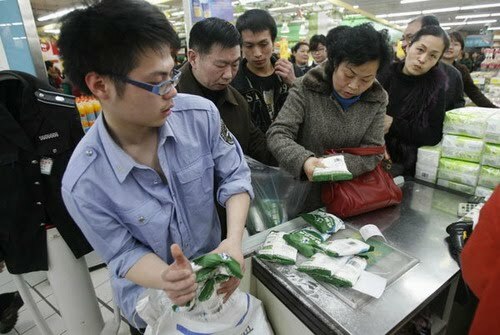 There is still a lot of work to be done to solve the food safety problems in China and to address people's concerns.